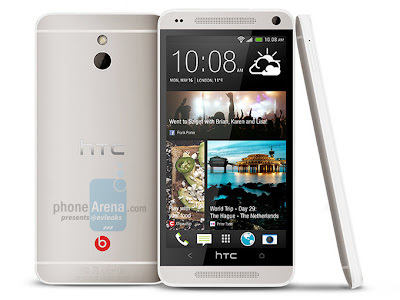 The HTC M4 leaks: If this is real Samsung might have to rethink their S4 Mini plans! HTC might have been in dire straights at the end of last year and the start of this, but with their new flagship the One getting rave reviews left right and centre it's safe to say that the company should have sturdied the ship lately. With that in mind it seems like the company are keen to capitalise on the success of the HTC One with something which is a little bit cheaper, but in many ways similar! That's seemingly why we have this device, the M4. The guys over at EVLeaks have struck again and the device you see above is to all intents and purposes the little brother to the HTC One. The best way to think of it is as the Galaxy S3 Mini to the Galaxy S3, but without the huge gulf in specs which those devices have! If the rumours are right this device will have a great 4.3-inch 720p display and a dual-core processor, which is currently unspecified. These will be backed up by 16GB of internal storage, 2GB of RAM and HTC's UltraPixel camera technology. As you can see in some regards this is a step down from the HTC One and as such it should be less battery intensive, we certainly hope so because HTC has chosen a 1700mAh battery which is said to be non-removable, something which we're still not fans of especially given the small cell capacity here. According to PhoneArena the device will be able in the last few weeks of May or during June and it is set to arrive with Android 4.2 at the helm and LTE connectivity too! For those who can't quite afford the premium on the HTC One this device could be a fantastic alternative. If HTC keeps the aluminium casing and they manage to keep this affordable then Samsung will have problems shifting a Galaxy S4 Mini if it lands in the same price bracket! If this is right then the summer is shaping up to offer a great range of phones in the mid-tier!